Set of 3 automatic motion sensor lights - no electrician needed! Automatic Motion Sensor Lights turn on and light your path as you walk by - no wiring needed! Do you find that sometimes you have to get up in the night to use the bathroom downstairs? Maybe your family complain at you for turning all the lights on and waking them up? Moreover, with the mornings getting darker in winter it is always useful to be able to see where you are going without having to wake up your family from their peaceful slumber. The Automatic Motion Sensor Lights by Ideaworks not only make your staircase appear modern and attractive, they will help you find your footing easily when you can’t, or don’t want to, illuminate the whole house to find your way. 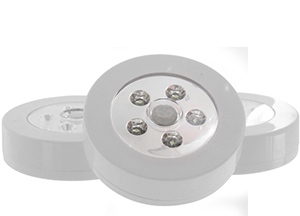 The Automatic Motion Sensor Lights couldn’t be easier to use and install. All you need to do is peel and stick them to the wall on the staircase. Each light requires 3 AAA batteries (not included) to operate. The 15 bright white LED bulbs are energy-saving and environment friendly, so you can enjoy your lights for longer. As you walk up or down the stairs the lights will illuminate enabling you to see perfectly, while saving money on your energy bills of course. Of course they are excellent to use up the staircase, but you can have them anywhere in the house that you desire; corridors, bedrooms, living rooms and anywhere else you require some extra light. You know that problem of tripping over the cat or dog during your midnight dash to the loo? Eliminated! Why not place your lights towards your bathroom so you can have a peace free journey with no unsuspected flights across the landing. Banish your midnight mishaps once and for all and invest in the handy Automatic Motion Sensor Lights by Ideaworks. Use of stair cases, landings or anywhere you need light for safety and comfort.